Waterval Onder is a hamlet situated at the base of the escarpment on the banks of the Elands River below a 228m waterfall in Mpumalanga, South Africa. Hence the name which means ‘under the waterfall’. The hamlet did not develop into a town like its sister town of Waterval Boven ‘above the waterfall’. Both settlements were established because of the Pretoria – Delagoa Bay railway line. Nestled in the beautiful Elands Valley, on the Eastern side of the historic NZASM Tunnel. 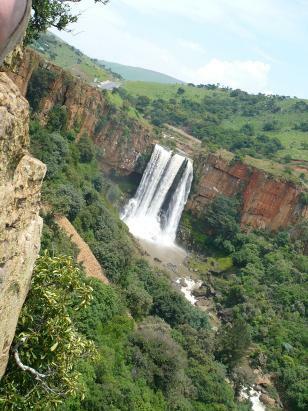 The Elands Valley is demarcated by the NZASM tunnel in the west, Drakensberg mountain range in the south and north and the Montrose Falls in the east. Topography and Climate. Having a topography ranging in altitude from 2000m (similar to Dullstroom’s height) down to a distinctly lowveld 1100m, the valley is unique in its climate. Summers are made up of hot days and temperate evenings, due to the air flowing off the highveld. Winters have cool evenings with balmy days. The weather does not get much better than this. Importantly, there is no malaria in the Valley. Rainfall is higher than the lowveld with the influence of the mist on the edge of the escarpment. Whilst hiking, it is not uncommon to look down on your own personal cloud floating below you. On The Maputo Corridor. The Maputo Corridor in the form of the N4 national highway and the railway line neatly bisects the valley from east to west, providing easy and safe access to the region. Waterval Onder is situated 40 minutes from Nelspruit, under a hour to the Kruger National Park and just over 2 hours from Johannesburg and Pretoria. Half-way between Johannesburg and Maputo, Mozambique. What Makes The Valley Special. The Elands Falls, the 120 year old tunnel, the imported turn-of-the-century, dressed stone NZASM railway tunnel, the Five Arches Bridge, imposing sheer red sandstone cliffs and the Elands River all assail ones’ senses within minutes of each other, the moment one descends into this very special valley from out of the tunnel.